Schoolcraft wrestlers did very well at the State meet, according to their coach Rob Ling. Steve Rantz took 5th at 160 lbs and Cody Mikel took 5th at 189 lbs. Vicksburg wrestlers, Luke Mallery took 8th place at 171 lbs, and Cody Cousins took 8th place at 189 lbs. Science Night at Vicksburg Middle School: Families from the Vicksburg Middle School (VMS)were treated to science activities and exhibits when they attended the Family Science Night in March. Representatives from several area industries were present to demonstrate how science can be applied in daily life, business, careers and hobbies. It was sponsored by the VMS Science Department and VMS. Pfizer, Bridge Organics, Sheriff’s Department Crime lab, Dovetails of SW Michigan, Bronson Hospital, Critchlow Alligator Sanctuary, and Earth Explorations were the presenters. Pictured here are: Ayden Flickinger (orange sweater); MacKenzie Hogue (goggles & hairnet); Chase Stenger, (orange striped hat looking through microscope); unidentified person looking through the twin lens of the microscope. Science Night photos by Jammi Fuller. Wellness is a goal many people work to obtain, and not so many succeed, said Kim Armitage, science teacher at Vicksburg High School. She is the positive force for the employees of the Vicksburg School District as she spearheads the drive for healthy school employees through an incentive offer of a ‘Fitbit’ to every person signing up for the wellness program that was run through West Michigan Health insurance staff. were off and running,” she said. provided the ‘fitbit’. It was expected that over 100 personnel would take part in the program, she said. The instrument clips on to clothing and measures the above items along with monitoring sleep patterns. Participants can set up their own goals, exercise regimen, fiber intake and reducing the amount of sugar they eat. The important thing is motivation to reach goals by bringing greater fitness into each person’s life, Armitage said. Dancing the night away is a fun way to raise money, especially if it is for a good cause, says Jim Shaw, board member of South County Community Services (SCCS). He should know, as his band played for many years for dances, but that meant he and his wife Virginia didn’t have much chance to “cut a rug,” he says. The “Dance Across the Decades” will be held on Saturday, April 26, from 7 to 11 p.m. at Local 357 Plumbers and Pipe-fitters Union Hall, 11847 Shaver Road in Schoolcraft. Seventy-five percent of the ticket price of $75 per couple or $40 per individual is tax deductible and goes directly to provide client services at SCCS, Danna Downing, executive director says. to make up for all the years they missed. It’s all for a good cause, he says, so those who just want to get together with friends, have a fun evening and support SCCS, are urged to attend. The tickets are available from any of the board members or just by calling the SCCS office at 649-2901. Tickets include music, food, and prizes for best steppers. The music will be provided by DJ Dan Can who plays all kinds of music from the 1940s through the present. Board member Kristina Powers Aubry has planned the gourmet delights and munchies for the occasion, and ordered up plenty of beer, wine and soft drinks. She has a raffle going with prizes such as free rounds of golf at Angels Crossing, custom made furniture and other surprises she will only reveal that evening. reserved right now, says Larry Forsyth. He is also on the board and expecting to be in the peanut gallery on April 26. 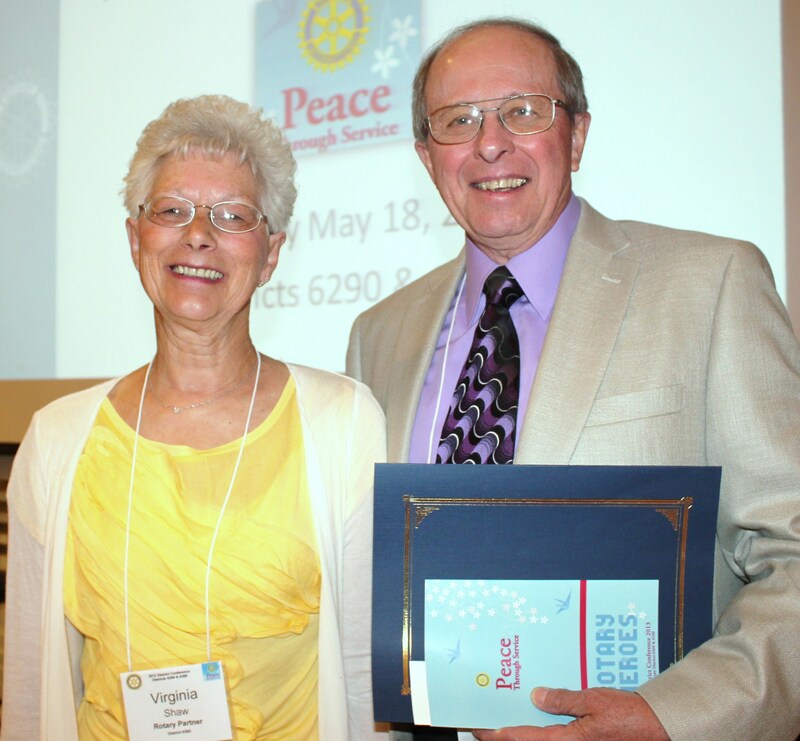 Timothy Moore, a long-time Rotarian with a strong community involvement, has been chosen as Vicksburg Rotary Club’s Hero of the year. He has had perfect attendance since joining the Club in1964. He has held all of the Club’s leadership positions and was honored by the Club as a Paul Harris Fellow. He has participated in the annual Vicksburg Rotary Showboat for 50 years, served on the script committee, in the chorus, and as a cast member. His community involvement has included: Vicksburg Community Schools Foundation, Vicksburg District Library expansion project, high school locker room building fund raiser, Vicksburg Historical Society, the local United Way committee, and most recently the community pavilion project where he procured trees and supervised the mill sawing of the timber. He will be honored in May at the Rotary District Conference in Kalamazoo, when the 64 clubs in the area, come together. 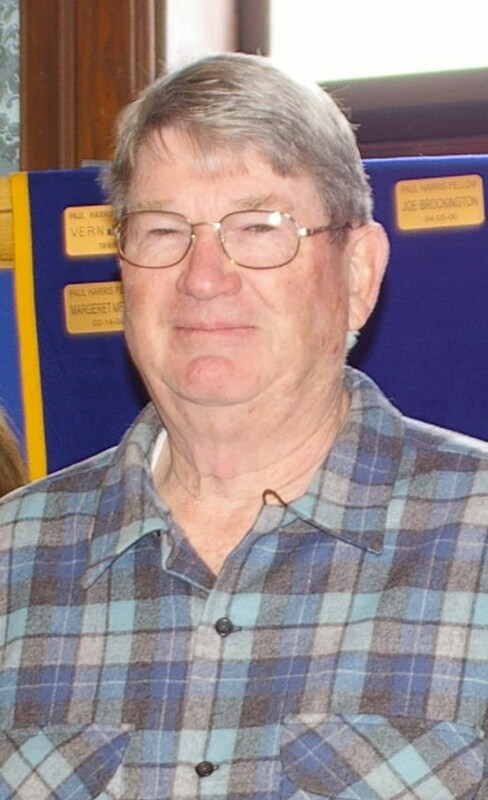 Other Vicksburg Rotarians who have been selected for this honor in past years include Warren Lawrence, Gordon Oswalt, Richard Coppes, and Jim Shaw. 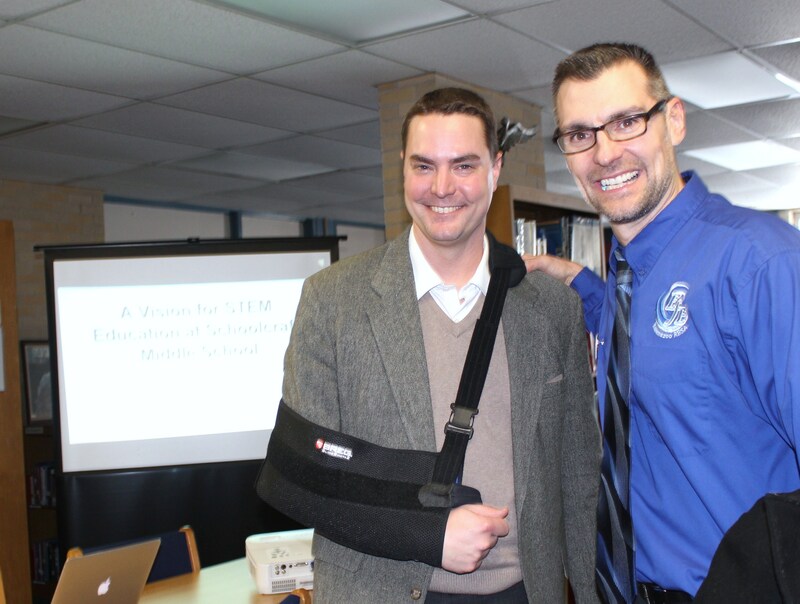 Members from local corporations who participate in PLTW, gathered in the Schoolcraft Middle School media center to see a slide presentation from Principal Chris Ebsch and Jason Luke (pictured below with Ebsch’s arm in a sling). Science has become more hands on for students in the Schoolcraft and Vicksburg school systems through a KRESA program known as Project Lead The Way (PLTW). Jason Luke, a former counselor in the Vicksburg School system, moved to KRESA two years ago and pretty soon, PTLW was part of his responsibility. He and others at KRESA researched what was needed by local industry, often hearing back that they need machinists, welders, and the like, coming out of area high schools. The hope was to find a program that could be integrated into math and science classes in K-5, 6-8, and finally in high school, in order to plant this seed early. They found a good model in both the Jackson and Lenawee Intermediate School Districts and decided to adapt it to Kalamazoo County. They did this in Schoolcraft Middle School Carol Lafave’s, design and modeling class, Portage schools, Vicksburg’s course was set for Dave Vales Engineer and Design classroom in the high school. 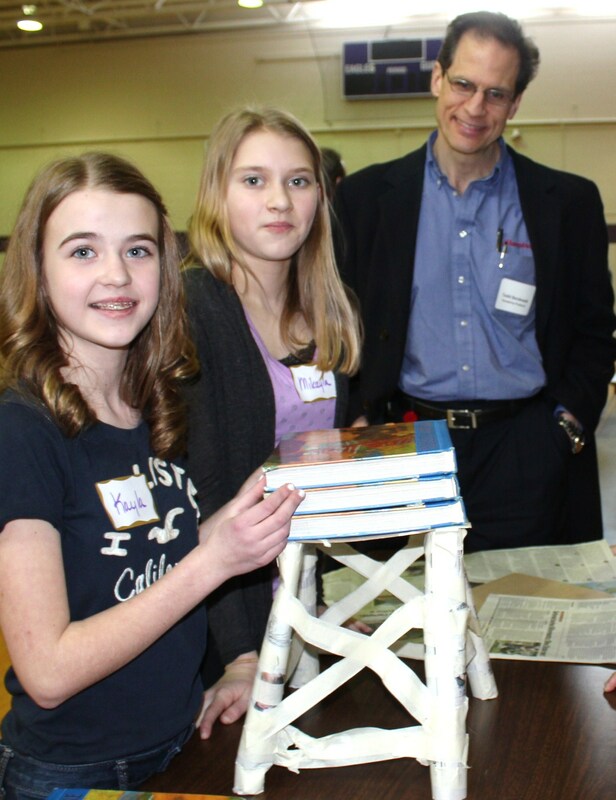 Kayla Julien and Mikayla Meade, build a book tower out of masking tape. In Vicksburg, it was all about redeveloping the drafting program because as in most high schools, woodworking, metals and home economics have been eliminated. 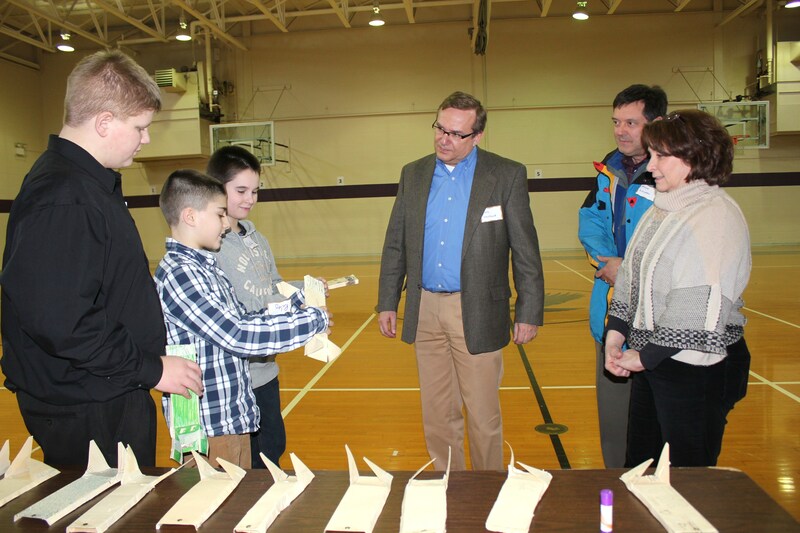 One year after first seeking support for introducing the science/tech education program known as Project Lead The Way (PLTW) into Kalamazoo County schools, organizers thanked the corporate sponsors and business leaders with a Manufacturers Appreciation Day in late February. River Fox, Riley Watts, and Nick Versluis show industrial representatives their work. Luke says PLTW will expand to reach 3,000 to 4,000 young people in eight area middle schools next school year, and he anticipates up to 10,000 students participating throughout Kalamazoo County by the 2015-2016 school year. Corporate sponsors of PLTW in Kalamazoo County schools include Accu-Mold, Humphrey Products, Schupan & Sons, Flowserve, American Axle & Manufacturing, General Motors, Stryker Corp., Graphic Packaging and Autocam. The program also has received funding from the Hall Technology Initiative and the Southwest Michigan Technology Consortium. Now taught in more than 5,000 schools nationwide, Project Lead The Way engages students in STEM (science, technology, engineering and math) courses using hands-on, inquiry-based methods. become the higher-level thinkers and problem-solvers needed for the workforce of tomorrow,” Luke said.